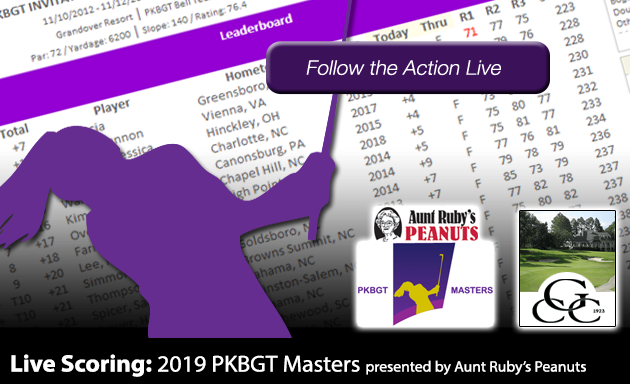 On Saturday, April 5, the Peggy Kirk Bell Girls’ Golf Tour played the first round of the 2019 PKBGT Masters presented by Aunt Ruby’s Peanuts at Greenville Country Club in Greenville, NC. Savory scents of smokey barbecue danced across the pavement to the 10th tee and beyond at Greenville Country Club early Saturday afternoon. The mouth-watering aroma of the Optimist International Club of North Carolina East’s flaming grill preparing a mid-day feast for the first round of the 2019 PKBGT Masters. The event, presented by Aunt Ruby’s Peanuts, kicked off before the crack of dawn. Players were greeted by total darkness to check in shortly after 6 a.m. with tee times starting at 7:30 a.m. 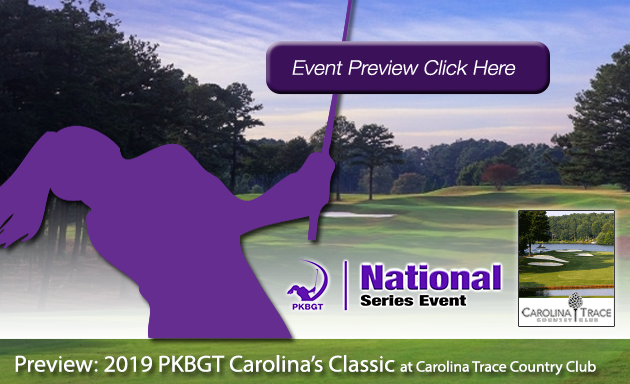 The 36 player Bell National field faced the gauntlet of a 36 hole double-round, so the early afternoon lunch catered by the OIC of North Carolina East provided a much-needed boost to power through the second round. For the remaining 48 players within the Prep Preview and Futures National divisions, the meal served as a celebration for the completion of their first round. Paired with Aunt Ruby’s spectacular sample spread of their various flavors of peanuts, the girls could reflect on their performance and prepare for Sunday’s final round in comfort. 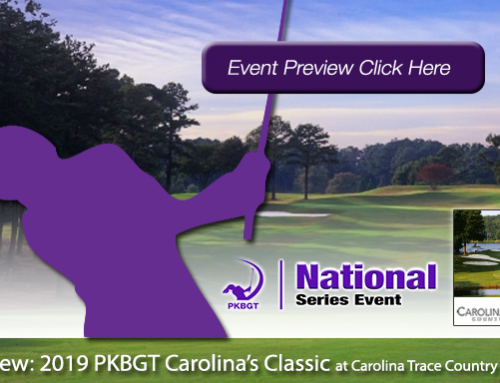 Friday afternoon showers were set to clear for a sunny Saturday at the home course of the East Carolina University Women’s Golf team. Though the forecast’s false prophecy of warmth and sun left for a dreary start to the morning, the rain eventually cleared and the sun peaked its head out of the clouds for a brief moment. The Lady Pirates’ past and present PKBGT alumni jumped at the opportunity to volunteer and give back to the players who stand in the same shoes they once filled. The field was met by the smiling faces of the current Division 1 college golfers eager to get the tournament started. 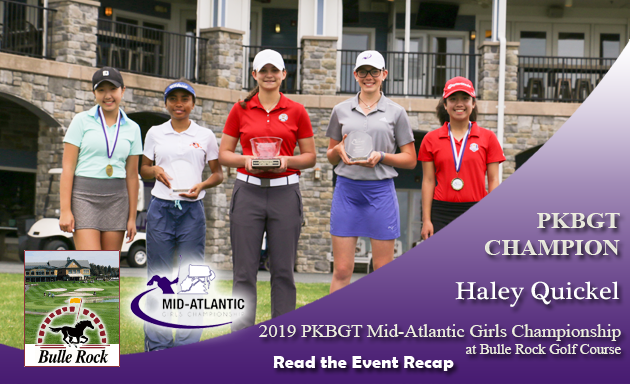 On the course, it was a one-horse race in the Bell National division while the margin was slim in the Prep Preview and Futures National divisions. Sunday’s final round brings with it an opportunity to improve on Saturday’s performance and make one run towards the top of the leaderboard. We take a look at where each division stands after the first day of play. 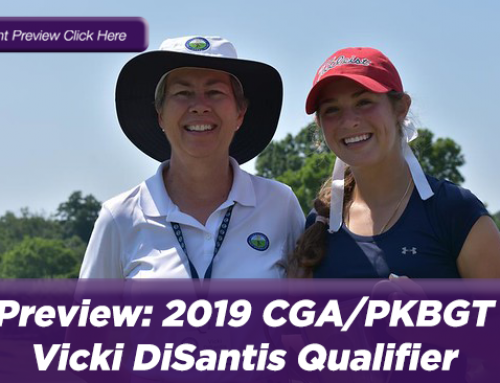 Greenville Country Club was the sight of an absolute golf clinic hosted by the PKBGT’s top-ranked player on the Performance Index. 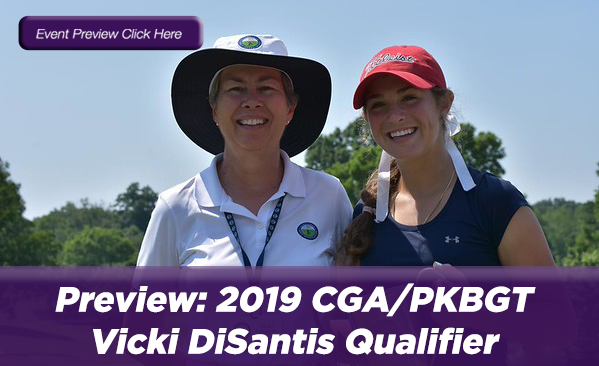 Amanda Sambach (Davidson, NC 2021) wasted no time jumping out to a healthy lead with an astonishing first-round score of 67 (-5). A short break for lunch didn’t phase Sambach, who returned to the course to match her first round score for a second five-under-par performance in a row. She is the leader by 17 strokes entering the final round, with a total score of 137 (-10). 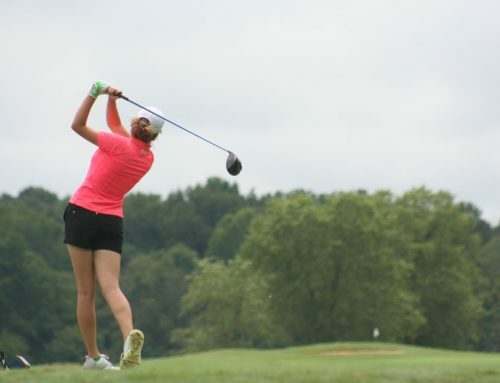 Currently in second place following the first round of play, Sue Lee (Lorton, VA 2022) slipped into a comfortable rhythm in the second round of play, shooting even-par 72 (E). Lee’s second round included two birdies on the front nine and a clean back nine aside from one bogey. Combined with her first round score of 79 (+7), Lee enters Sunday’s final round with a total score of 151 (+7). Kendall Turner (Chesapeake, VA 2019) and Adrian Anderson (Murrells Inlet, SC 2022) sit in a tie for third place following the first two rounds of play, each shooting final scores of 154 (+10). Turner came out to a tough start, finishing the first rond with and 81 (+9), but rallied back with a 73 (+1) in the second round. Her afternoon included a birdie on hole 13 to push her into a good position. Anderson remained consistent through both of her rounds with scores of 77 (+5). Rounding out the Top Five in a three-way tie for fifth place is Kayla Bartemeyer (Mount Pleasant, SC 2020), Emma Chen (Derwood, MD 2022) and Meher Mankikar (Bridgewater, NJ 2020). All three players finished Saturday with total scores of 156 (+12). The antithesis of the Bell National field, the Prep Preview leaderboard is jam-packed with players vying for the Masters championship. Currently leading, with a first-round score of 77 (+5), is Megan Morris (Cary, NC 2021). Morris’ round featured two birdies including one on the par three 10th hole. Sydney Hackett (Ashburn, VA 2022) is just one stroke behind Morris after the first round, posting a score of 78 (+6). The highlight of Hackett’s round was a birdie on the 15th hole and she is poised to challenged Morris in tomorrow’s final round. In a two-way tie for third place, McKenzie Daffin (Fayetteville, NC 2023) and Abby Franks (Roebuck, SC 2023) finished the first round with scores of 79 (+7). Daffin finished with two birdies on the day including hole 18 and Franks matched that number scoring two of her own. Much like the Prep Preview division, the Futures National field is open for the taking and anyone can come out with the PKBGT glass bowl. Josephine Nguyen (Springfield, VA 2024) currently holds the lead after a first-round score of 79 (+7). Nguyen’s best hole of the day was a birdie on the par-five sixth hole. 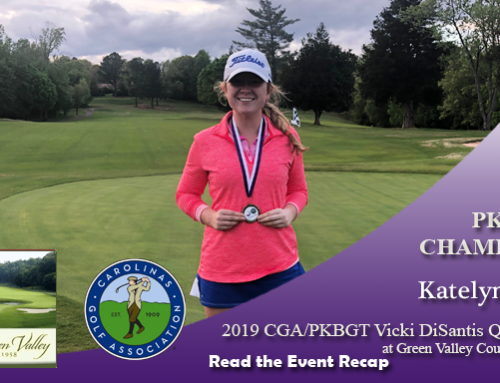 Following up her win at the Palmetto Classic, Grace Ridenour (Cary, NC 2025) is falling in love with Greenville. This weekend, in North Carolina’s Greenville, Ridenour sits one stroke behind Nguyen in second place after a first-round score of 80 (+8). She is poised to make a push for first place in Sunday’s final round. A frequent member of Top Five finishes, Sophie Lauture (Raleigh, NC 2024) is in position to earn a medal yet again. With a first-round score of 82 (+10), Lauture sits in third place and looks to make a move forward on Sunday. 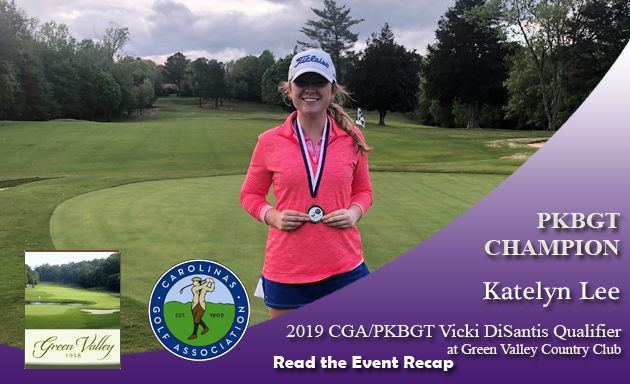 Grace Addison (Abingdon, VA 2023) finished the first round in fourth place with a score of 83 (+11). 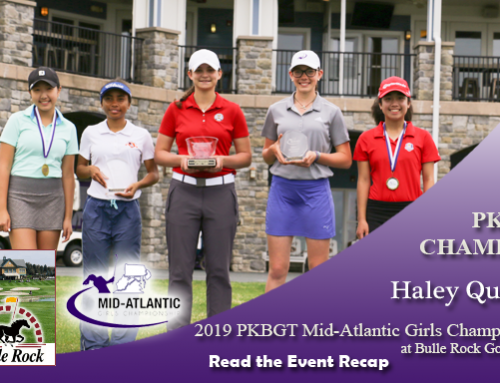 Rounding out the Top Five in a three-way tie for fifth place is Kitson O’Neal (Pinehurst, NC 2023), Madelyn Vogan (New Bern, NC 2023) and Amanda Meno (Murrells Inlet, SC 2021). Each of the three had scores of 85 (+13) in the first round. It will be difficult for Amanda Sambach to top her Saturday performance, but she has room to work with come Sunday. In the remaining divisions, it will be a close contest where anyone can boost to the top of the leaderboard to take home the championship. Tee times are set to begin at 8 a.m. tomorrow morning!